The French illustrator’s first “literary” effort, The Mindfulness Colouring Book: Anti-stress art therapy for busy people, sits on top of the Australian independent bestseller list. Yet aside from the book’s title, a one-page introduction and a brief thank you note on the last page, it contains no text. Instead, the pocket-sized book is filled with pages of black and white line drawings, designed to offer stressed-out adults much-needed colouring-in therapy. And nothing is lost in translation when it comes to adult colouring-in book sales. A fad that emerged just before last Christmas, Readings has at least 15 titles in stock. 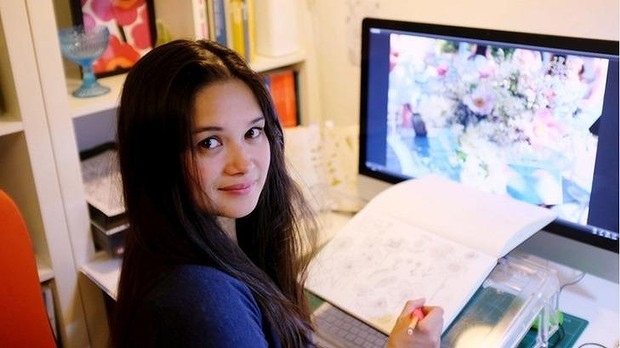 Johanna Basford’s The Secret Garden and The Enchanted Forest are among the top sellers. Readings’ head of marketing, Emily Harms, says Farrarons’ offering ticks several boxes. Particularly its slightly highbrow, self-help-sounding title. Farrarons’ British publisher, Boxtree, reports 180,000 copies have been distributed to bookstores and 100,000 of those have been sent to Australia. So it’s no surprise the illustrator is busy working on her follow-up, the imaginatively titled More Mindfulness Colouring: More anti-stress art therapy for busy people, which is due for release this year. “For this one, I’ve been doing lots of research on leaves at Kew Gardens,” Farrarons says, referring to the large botanic gardens in London. She says she’s been particularly enamoured by the tropical section. Other objects that have caught the illustrator’s eye include pineapples and artichokes from the local fruit shop and a woven egg basket spied on a recent trip back to her birth country, the Philippines. Ultimately, her success comes back to doodling. Read more about the book and its author on Emma Farrarons’ website, here. See how people have taken to the book on Instagram by following #mindfulnesscolouringbook, here.